Looks like you may be bidding against me. It doesn't help when bidding against a fellow forum member - as there is only the one 5kW Growatt battery on a certain internet auction site. OK so I've made some progress today. After several re-boots of the SHM 2.0 and following nowty's advice I now have both the SHM 2.0 and the inverter 'visible'. There is still an issue however as I've no display of 'Total Consumption' as the attached screen shot should show. Having finally had the system 'recognise' the inverter one of the pages required me to input information iro to the inverter including which phase it was on i.e. L1, L2 or L3. I clicked L1 as there is only the one phase and that is the one the CT is connected to on the SHM 2.0 as previous pictures have shown. The CT fitted is https://uk.rs-online.com/web/p/current-transformers/1718755/, the SMA specification is for a CT designed for a secondary current of 5A and with an accuracy of at least Class 1. It only has two wires to connect it and I checked the continuity when I connected it. It is definitely fitted to the live cable. Any suggestions/ advice or comments willingly received. Extra addition - been out with my trusty clamp meter. 4.5A on the main live cable and 0.2A in the wire from the CT to the SHM 2.0 which give or take the accuracy of the meter is a reading roughly one twentieth as one would expect for a 100A/ 5A CT. My question is how does the SHM 2.0 'know' it's not directly connected and needs to multiply everything by 20? I've answered my own question. I've found out how to 'tell' the SHM 2.0 it is connected to a CT. It would help if the SHM 2.0 instructions told you clearly that it needed to be 'told' a CT was connected!! Anyway now it is sorted I attach two screenshots showing the Immersun view and the SHM 2.0 view. The PV isn't generating at this time of night, it is the Growatt battery discharging. The Growatt Smart Energy Box has arrived so shortly I'll be heading out to fit that. Meanwhile the two attached pictures show a slightly confusing picture. At the moment the SHM 2.0 is only aware of the one inverter producing any input so I think it is partially confused as we are very clearly exporting energy at the moment but the SHM 2.0 sees it as importing!! Having acquired another Speedwire capable inverter the situation will improve when I get back from the next bit of offshore work but this will still leave me needing to find a second hand SB1.5-1VL-40 at some point so the entire PV production can be captured electronically. Why do I hear some viewers asking? My original 1.28kW of panels are a rollover from the ROC days so any generation has to be separately metered and the quoted inverter is the only one I'm aware of that 'small' that will do the job. Richard, you don't need to get another speedwire capable inverter. You can get another SMA energy meter and fit so ALL your generation goes through it. You then specify that your speedwire inverter uses the extra energy meter rather than its own internal one. I have now done this with my own system as I have one SMA4000TL-21 (speedwire version) and a SMA4000TL-20 (non speedwire version). I have now got my new BIG Sunny Island integrated and all with the magic 3.68kW export limit. Your SHM 2.0 should not be confused about import/export if you have it correctly fitted at the grid connection point, I note you are using the CT clamp so have you fitted it the right way around ? PS - Very sunny here this morning ! One stage at a time. One of my two Growatt's seems to have a currently non-functional output to the Growatt RF stick so I've implemented the other one and I now have a Growatt remote access facility as per the attached picture. I'll go out and give the CT a dose of looking at, there was no suggestion in the manufacturer's details that it was directional? The SMA Energy Meter is an option but I wanted to replace the 'old' inverters and I wanted to access the higher level of information from a Speedwire capable inverter, it may prove cheaper than the small Speedwire capable inverter though. A quick rush out at half time and the SHM 2.0 CT has been turned around. Plenty of sun here today as well (kettle was on at the time this was taken). Growatt now 'fully' charged. Pictures attached. Having access to new information now has me asking even more questions. 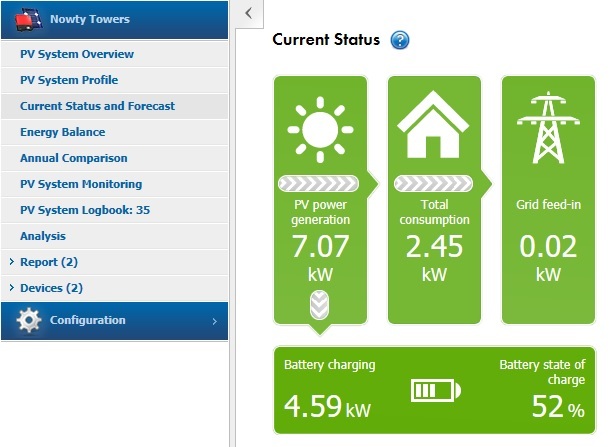 The Growatt is currently discharging via the inverter as recorded by the Immersun software but the SMA system reports as per the picture below. I have no idea why the SHM 2.0 is reporting the 'errors' it is. Could be a comms issue, hows your internet speed and latency these days? You could well have hit the nail on the head wrt it being an internet access issue. I have set up the SHM 2.0 to carry out updates automatically, I have twice tried to tell the system to do the same with the inverter but it throws up an error message. If you look back some way back in this thread you'll see I updated this 'new to me' inverter relatively recently. Mind I also have to find out why this latest SHM 2.0 functionality doesn't display the local meteorology. As I say it is a case of making progress one step at a time. Advice/ observations are welcome from any corner. This explains the absence of meteorological information. Well I'm slowly sorting out niggles in the software mainly caused by erroneous data entered by yours truly. It's sunny up here in NE Scotland ahead of the foul weather coming our way from the west. A selection of shots to show what is happening here on the RE front. The Immersun is diverting energy to the EHS, the Solar ET is doing its bit and the house heating is coming from the EHS. The PV extension is charging the Growatt. Well another sunny morning so far, I'll be heading away shortly. Pictures essentially the same as yesterday but things are starting to work the way I always intended i.e. Solar ET and diverted Solar PV running the house heating for part of the spring/ autumn period. When I get back next time I'll be looking to fit both the SMA Energy Meter and the SB3600TL-21 I've now sourced. This will enable the SHM 2.0 to track all PV production with the exception of what goes to the Growatt. I'll have ordered the extra Cat5e cables, another switch, a 5 way consumer unit c/w MCB for the Energy Meter by the end of the morning. I'm still aspiring to getting another Growatt battery and going down a similar route to nowty - I'll need to save up for the Sunny Island. Been editing the 'My Plant' details in the ShinePhone app and noted that Growatt also have you entering longitude before latitude, I now need to communicate with two organisations and suggest they change things - will it change anything I wonder? Saw a new production high on the Solar PV front (although I'm sure that as the year progresses this will be superseded - will need to implement the Export Limitation function) and the Growatt battery is now charging more frequently and to a greater amount. Sat as I am some distance from home (80 odd miles east of Shetland) the Growatt is discharging. It did this in the early hours of this morning as the energy in the EHS kept the heat pump at bay until around midnight. That'll be it from me until the next 'development' stage is arrived at.